Is this the correct tank monitor for my application? Maretron's Fluid Pressure Monitor is used to adapt up to six pressure transducers to the NMEA 2000® network (pressure transducers sold separately). This allows you to observe fluid pressures and tank levels anywhere on the vessel where there are NMEA 2000® compatible displays. With the appropriate transducer, the FPM100 reports either pressure or vacuum for a variety of applications including water pressures, oil pressures, hydraulic pressures, or system vacuum for detecting clogged filters. The FPM100 also has a tank level mode, so that fluid levels in a tank can be monitored via a pressure transducer mounted at the bottom of the tank and transmitted over the NMEA 2000® network. This allows you to monitor the fluid levels in tanks that are extremely deep, have internal structures, or are otherwise not suited for other tank level sensing technologies. In this mode, the FPM100 can be calibrated for irregular tank shapes so that you know the true level of the tanks. The FPM100 is NMEA 2000® certified so you can view any and all information anywhere on the vessel using a compatible NMEA 2000® display. The FPM100 is a key component of Maretron's N2KView® vessel monitoring and control system. Note that diesel fuel is lighter than water, and so the maximum tank depth can be increased by about 10% when these sensors are used to measure diesel fuel tanks. 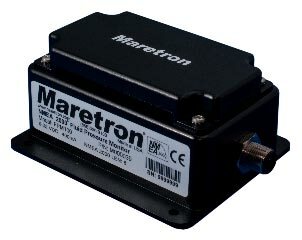 Maretron pressure transducers are not approved for use with gasoline. If you wish to use the FPM100 to monitor pressures or levels of gasoline, you must obtain a 4-20mA pressure transducer that is approved for use with gasoline.